Get trained and learn to serve as a compassionate and effective ally to those struggling with eating disorders. Please note: Embody trainings include content that can be emotionally difficult and potentially triggering. A professional from the Center of Excellence for Eating Disorders is on hand at every training to handle participants' needs. We ask that you honor yourself and your needs throughout the training. 3Signing up for an Embody training is a commitment to the trainers and Center of Excellence for Eating Disorders professionals that dedicate their time, but even more so to the people that will ultimately be affected by the allies prepared in the training. Please honor that commitment and attend the training that you sign up for. Again, we appreciate your dedication to becoming a compassionate and effective ally for those struggling with eating disorders. What to Expect: Embody Carolina trainings last 2.5 to 3 hours. Participants learn about the signs and symptoms of eating disorders, how to recognize when a peer is struggling, how to approach a peer who is struggling, how to serve as an ally throughout the recovery process and about resources in our area for patients and allies. 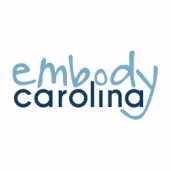 Trainings are led by trained Embody Carolina members and a professional from the UNC Center of Excellence for Eating Disorders is present at every training. We encourage participants to bring whatever they need to feel comfortable throughout the training (snacks, etc.) and to notify us if they need any reasonable accommodations. Embody is committed to making our trainings accessible and a positive experience for all participants. Please contact us at embodycarolina@gmail.com with any comments, questions or concerns.